Daylight saving time starts tomorrow morning and, for me, it can’t come soon enough. It will still be daylight well after 7 p.m. and, come June, the sun will still be with us until after 9 p.m. This weekend’s switch to daylight saving time is the first since the passage this past December of the Hawkins Gignac Act (Carbon Monoxide Safety), 2013. When the legislation received royal assent, it marked the end of a five-year campaign by Progressive Conservative MPP Ernie Hardeman (Oxford). 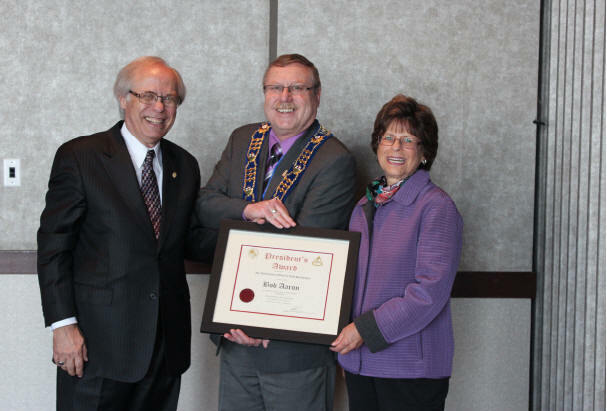 New in Homes & Condos columnist Bob Aaron, left, recently received the inaugural President's Award from Eric Ansell, outgoing president of the Association of Ontario Land Surveyors, with Aaron's wife, Dorothy. Aaron's support of homeowners' land surveys earned him the award. The legislation was introduced as a private member’s bill following the December, 2008 deaths of a Woodstock family — OPP officer Laurie Hawkins, her husband Richard and their two children, 14-year-old Cassandra and 12-year-old Jordan. The family died as a result of a slow buildup of carbon monoxide (CO) dueto a blocked chimney associated with a gas fireplac. Carbon monoxide is an odourless, colourless and tasteless gas that is a byproduct of the combustion of natural gas, propane, home heating oil or wood. It can cause death with prolonged exposure, typically when a heating source malfunctions or isn’t properly ventilated. And because it has no smell, victims lose consciousness without being aware of its presence. It can overtake people as they sleep, adding to the danger. With the new legislation, the Ontario government has the power to make carbon monoxide alarms mandatory in all Ontario homes with fuel-burning appliances or heating systems, fireplaces or attached garages, regardless of the date of construction. This weekend is a good time to check existing carbon monoxide detectors and buy new ones for any homes without one. I learned the hard way that CO detectors should be replaced every seven years. I’ve had two carbon monoxide detectors at home since they first came on the market. When one of my alarms went off, I called 911. Within minutes, a fire crew in full gear arrived to check out every room. After I got the all-clear, the fire chief handed me my defective detector, telling me to throw it out and get a new one. The Hawkins Gignac Act gives the government the authority to make regulations regarding the risk created by the presence of unsafe levels of carbon monoxide. Some sections of the act, however, will not be proclaimed until amendments to the Fire Code are filed. Changes to the 1997 Fire Protection and Prevention Act — which oversees the Fire Code — provide that provincial regulations will supersede all municipal by-laws where carbon monoxide is concerned. A technical advisory committee has been established, by the provincial Office of the Fire Marshal and Emergency Management, and will consult with technical experts, representatives from other ministries and a wide range of stakeholder associations to bring to the table the viewpoint of residents, landlords, tenants, the fire service, municipalities and safety agencies. Committee recommendations will form the basis for a broader public consultation on proposed changes to the Fire Code this spring. The Hawkins Gignac Act also proclaims the week beginning November 1 every year as Carbon Monoxide Awareness Week, aligning the need to check carbon monoxide detectors and appliances with the end of daylight saving time. Changing the time on clocks and maintaining safety alarms are two necessary tasks that are easy to perform and promote together twice a year. Even before CO detectors do become mandatory in all dwellings, homeowners and tenants should purchase detectors if they don’t have them, replace old ones, and remember to check them when the clocks move forward or back.